Man, can I be a slowpoke when it comes to writing articles on this site explaining why I made certain changes. It must’ve been 2 years now, and I took all that time? Sigh. I am so foolish. Oh well. For now, since I’ve finally written up something, let me inform the unaware that, what was once a site about everything related to the Hawks is now decidedly limited to just what was put out until the turn of the century, and no longer focuses on anything James Robinson and Geoff Johns (and to a lesser extent, David Goyer) set up. Not even if DC finally discarded the reprehensible status quo they were using as they produced Identity Crisis and kept in place for at least 12 years. I’ve since recognized that Johns and Robinson were so part and parcel in their own way – especially Johns – that I finally decided I didn’t want to do them any favors by enshrining their work on this site of mine alongside stuff coming from writers far more respectable than they are. When I first built this site in late 2004, I thought, without sufficient consideration, that I should include profilings and other data established by Robinson, Johns and Goyer in their JSA and Hawkman series during the early 2000s. But after years of witnessing the abuse Johns in particular had a hand in heaping upon the famous creations of the DCU, I finally decided I couldn’t go along with it any longer, and gradually began omitting material from this site related to his particular output. And I’m glad. As disastrous as the post-1989 alterations to the Hawks wound up becoming, I don’t feel as bothered about putting them here as I do the work of Johns. And that also goes for what Jimmy Palmiotti and Justin Gray were doing on the mid-2000 series after he left, which, as I ultimately realized, wasn’t any better. That doesn’t mean I approve of the mess DC’s editorial mandaters from the early 90s led to, but writers like John Ostrander are usually more respectable than Johns happens to be. 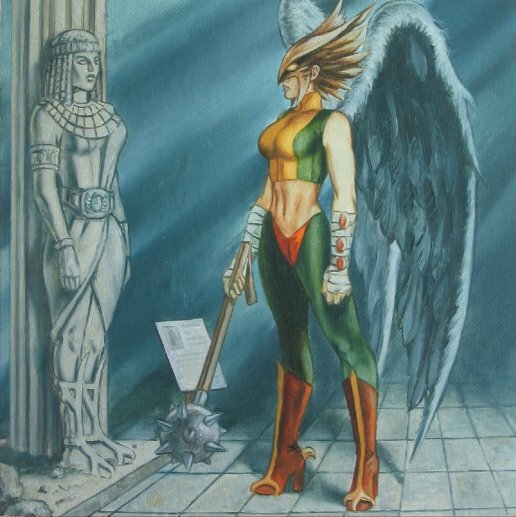 I don’t have anything against Kendra Saunders, the third official Hawkgirl, as a character. The problem in hindsight is that she wasn’t really her own agency. She was a shell. A vessel which original Hawkgirl Sheira Sanders could inhabit, after she’d been pointlessly wiped out at the time of Zero Hour, the 90s crossover that really brought the DCU down to new lows, along with Armageddon. And all because Robinson and Johns supposedly wanted to do something “different”, even as at least 2 would-be girlfriends of Carter Hall’s wound up dead pretty soon after they were introduced. Let me guess: they couldn’t decide if they wanted to do an uncle/niece relationship or a boyfriend/girlfriend relationship? Or they couldn’t decide how Sheira should be portrayed, as either an adult woman or a late-teens girl from a different family branch? Judging from how that series lost momentum faster after Johns left, and the poor treatment of the Hawks since, it’s clear they didn’t know what to do with any of the cast. After all, just prior to the Flashpoint crossover, Hawkwoman was mysteriously devoured by some greenery in a story involving Swamp Thing, and in the post-Flashpoint world, the only presence she had was in the guise of a Kendra whose racial background had been changed, in accordance with diversity-pandering, in the Earth 2 series. Much of this stuff is just so bad, I have no intention of giving it a place here on this site. I’ve done thinking over the years, and I feel I have to be a superhero fan who knows when it’s time to draw the line. I decided I didn’t want to be part of a crowd that doesn’t know when the time comes to quit and let DC and Marvel’s overlords know that we’re not going to take this anymore. I think what’s irritating about the work by Johns and Robinson is that, rather than try to reverse and un-canonize bad storylines like Zero Hour, they went right along with it by building their take on Hawkman and Hawkgirl off what Zero Hour established, when Extant wiped out a few of the Justice Society members. The whole story was so bad – including the Hal Jordan-as-Parallax fiasco – that validating it as canon only serves to send the editors a message that their work was brilliant when it wasn’t. And that’s why I’m not going to be devoting this site to the Robinson/Goyer/Johns material any longer, let alone the Justin Gray/Jimmy Palmiotti stuff, if that matters. (Indeed, some of their own “contributions” were quite embarrassing too.) Thus, I removed as much as I could from the site, and what remains is minimal, such as a Kendra picture I’ve put here. From this point onwards, it’ll be for stuff coming before that only. And even then, the post-1989 material by writers like John Ostrander is something I have to consider, even if it’s not as pretentious as what Johns was concocting. After all, the history mess largely began with Hawkworld and that’s something I’ll certainly have to address in time. The terrible direction set up by Identity Crisis may have been discontinued. But that does not mean we can just overlook what Johns did beforehand, and we shouldn’t follow the press’s example of trying to absolve him of blame, when he was more or less as guilty of the direction as anybody else involved in the publication of that sick miniseries in 2004. Copyright 2016 Avi Green. All rights reserved.